This report contains the data that was available on 26 July and supplemented by a county assessors data update during the week of 30 July from the Washoe County Assessor Records, yes, it’s amazing what happens when an election rolls around. Perhaps the late update was due to focusing on the upcoming election versus paying attention to the job at hand. The available data shows that we continue in the Summer buying/selling season in a BIG way with an additional ten (10) properties changing owners during this reporting period. This is down by 47% from last month, but still going strong. Custom Homes on the Golf Course (Non-Residential area) now exhibit a 3.5% premium to custom homes not on the course. In the mean-time, semi-custom homes not on the course are enjoying a 4% premium to those abutting the course. This, of course, leads to the question of ‘What are the value propositions for ArrowCreek properties?’ One of the key ‘propositions’ is that ArrowCreek owners’ have the option to join ‘The Club at ArrowCreek’ or not to join – an individual choice of freedom versus other gated communities. 1. ArrowCreek properties have stayed in the premium class within Washoe and Douglas Counties. As you read this report you will see that prices begun to trend together after a spike in property values for properties on the golf course in the spring of 2017. 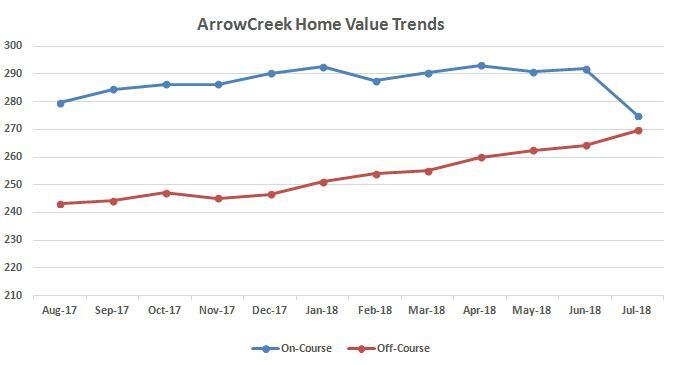 What this trend indicates is that custom homes in ArrowCreek appear to be settling into a growth pattern beginning in the $272 per square foot region. With ten properties in eight different neighborhoods changing hands this past month, the “hottest” neighborhood was The Reserve. Because of a past request from one of our readers for comparison of the ArrowCreek values with those in D’Andrea (Sparks market) and Somersett (Reno market), we’ve been sharing that data. However, we were unable to obtain that information this month and hope to have that comparison again next month.